Young men who sexually abuse is a subject of increasing concern amongst professionals. This important volume explores the current theoretical and practice issues involved in working therapeutically with young men who have sexually abused. 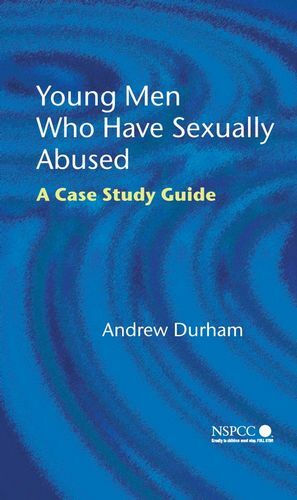 Linking theory to practice, Andrew Durham provides detailed case studies of young men who have committed varying acts of inappropriate or harmful sexual behaviours, and analyses the therapeutic interventions provided for each. A clear, practical framework for assessing whether or not a child’s sexual behaviour is a problem. Full assessment schedule for determining the risks and needs of young men who have sexually abused. Discussion of family assessment and support. Guidance for managing difficult foster placements. Advice on deciding when a young person is no longer a risk. Young Men Who Have Sexually Abused identifies the need for therapeutic interventions to be holistic and reach beyond purely offence-specific work. It will be a valuable resource for practitioners, academics and students in social work, social care, psychology and residential childcare. Andrew Durham has the Advanced Award in Social Work (AASW), and a Ph.D. in Applied Social Studies, from the University of Warwick, Which researched into the impact of child sexual abuse. He has over 20 years' experience of providing therapeutic services to children and young people, and is a specialist in post-abuse counselling and interventions for children and young people with sexual behaviour difficulties. He is currently a consultant practitioner and manages the Sexualised Inappropriate Behaviours Service (SIBS) in Warwickshire. He is a visiting lecturer at the University of Warwick. He also occasionally works as an independent child care consultant, undertaking therapeutic work with children and young people, consultancy, lecturing and training. He is registered with the Law Society as an expert witness, and has been as adviser to the BBC. He is the author of Young Men Surviving Child Sexual Abuse - Research Stories and Lessons for Therapeutic Practice published by John Wiley in 2003. He has also published a range of other papers and chapters on the subject of child sexual abuse.